In this post, the 2nd in a three part series for the Reportapalooza “Reporting Remix” challenge, I will describe my observations of SAP Crystal Reports Server after logging on with Internet Explorer into the Java Infoview portal. I logged into SAP Crystal Reports Server as the Administrator and was given two categories of options: Navigate and Personalize. Beneath the Personalize category was a Preferences selection. I’ve never been the type of person to pass on the opportunity to tweak a couple settings, so I clicked Preferences. Below is a screenshot of the initial screen displayed after I logged into the system. 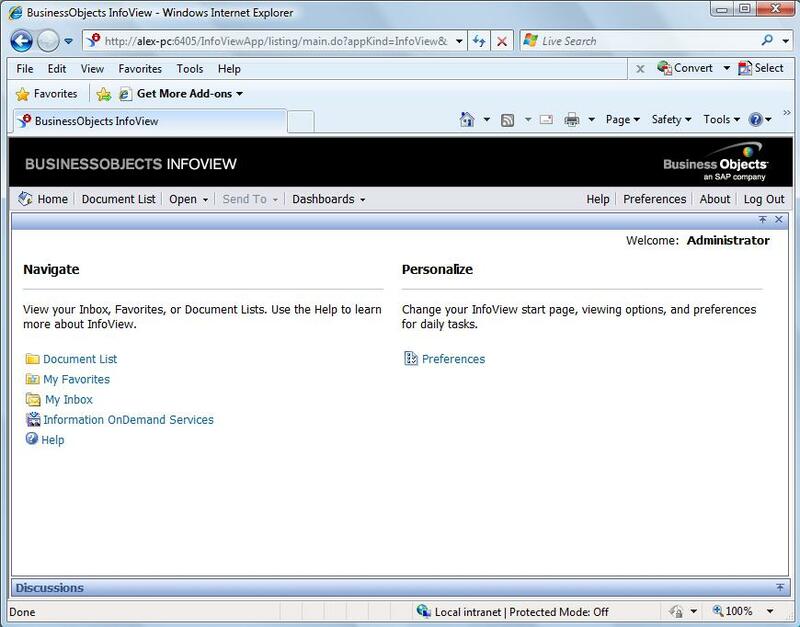 The General section was expanded by default and the first setting provides the option to change the InfoView Start Page. I modified this selection by clicking the option button beside Folder then browsing to the “Report Samples” folder. By making this selection, all of my subsequent logons to the SAP Crystal Reports Server will no longer display the Navigate and Personalize categories as previously described. Instead, I would be taken directly to the Report Sample folder. This option saves time and allows me to get right to the folder that contains the reports I’m most interested in analyzing. 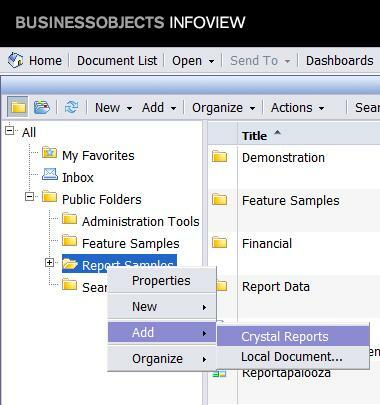 The contents of the Java Infoview portal, (or BUSINESSOBJECTS INFOVIEW as it’s titled in the upper left corner of the page header), delivers Crystal Reports and other local document types to users in a similar format as Windows Explorer. Users have the ease of navigating through a folder structure on the left side of the page while viewing the contents of the selected folder on the right side of the page. This basic style should be very familiar to anyone that has spent any time working with a PC. The simplicity in navigation seems like it would lead to a very productive user experience. To begin sharing reports with other users, I will need to add them to the portal. Will this be difficult or easy? Should I right-click or look for something like “Add”? The answer is: either. If you want to add a report to the portal, just click Add in the toolbar located across the top of the folder structure. After clicking Add, two choices will be available – Crystal Reports and Local Document. If Local Document is selected, you’ll have the opportunity to browse for a Microsoft Office document (Excel, Word, or PowerPoint), PDF, Text file, or other file type. If Crystal Reports is selected, you’ll be taken to a screen prompting you to select a Crystal Report. The screenshot below shows the Add button in action. 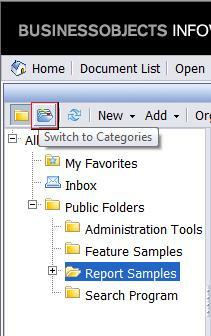 Another way of adding a report to the portal is by right-clicking on a folder and selecting Add. This option is available in the tree of folders on the left side of the screen. You can also right-click on a folders displayed on the right side of the screen to add a Crystal Report to the portal. Picture below is this example. Reports can be shared or delivered to authorized users in either folders, categories, or both. Folders are the primary structure for storing published report objects while categories seem to work as custom views that may contain reports from different folders. 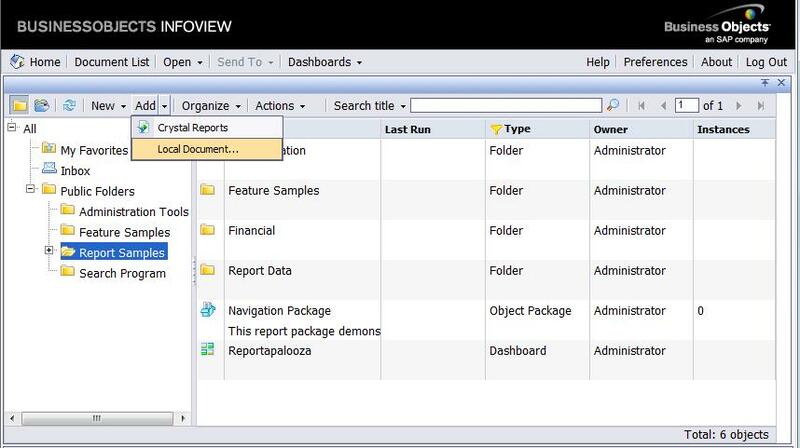 The My Favorites folder in the Java Infoview portal allows users to save their own personal copies of reports. This is a great place for storing report variations or reports that are still in the development and verification phase. The Inbox is an extremely useful feature for passing around instances of reports to other authorized users. Also, the Infoview Inbox is a common destination for sending the results of scheduled report instances. 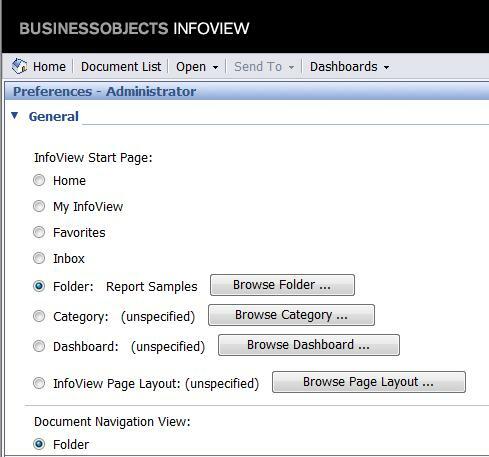 Any user with Schedule rights can send refreshed report instances to other users with a valid logon by selecting “Business Objects Inbox” as the scheduled destination while scheduling a report to refresh. After spending a short amount of time with SAP Crystal Reports Server, it has become very obvious how powerful this product can be to an organization. A report developer in Mobile can create a report, publish it to the portal, and then have users in Portland, New York, and Atlanta all view it within seconds of publishing it. With this type of collaborative environment, someone in another city can see a report quicker than someone four cubicles away can walk to your desk. Now that is cool! Please feel free to email me if you have any questions. Thank you! Posted in: Articles, Crystal Reports, Introduction, Training. In the fifth and final challenge of Reportapalooza, I’ll be writing a three part series of blog posts about the product at the heart of the SAP Crystal product line – SAP Crystal Reports Server. My experience with BusinessObjects software goes back to versions 6.1 and 6.5 and the days of Application Foundation and the BOMain.key. Then in 2006, I had the good fortune of being introduced to BusinessObjects XI and the new CORBA architecture. This led to an ongoing string of (mostly) enjoyable experiences installing, deploying, migrating to, and administering BusinessObjects XI R2, XI 3.0, and XI 3.1. These experiences also included many years of developing Universes, building Desktop Intelligence reports, Web Intelligence documents, and finally Xcelsius 4.5 and 2008 dashboards. But my experience with SAP Crystal Reports only goes back to version XI and I’ve never had the opportunity to even see SAP Crystal Reports Server. So I jumped at the opportunity to install and peruse SAP Crystal Reports Server as part of the “Reporting Remix” and Reportapalooza. Posted in: Articles, Crystal Reports. Due to performance limitations within Xcelsius, it can be difficult to build large scale dashboards that are easy to manage. Fortunately, Xcelsius comes equipped with components that makes it easier to create a single “Parent” SWF which can load multiple “Child” SWFs inside itself. Perhaps the biggest challenge with this design architecture is enabling the “Parent” SWF to communicate with the “Child” SWF. Luckily, with the use of Flash Variables and the SWF loader component, we can easily overcome this challenge. Posted in: Components, Dashboards, Examples, Flash Variables. Inspired by Joshua Tapley’s UFO tracker, I’ve tried my hand at creating this cool animation using Xcelsius. I will be posting the source code soon, however, I would like to hear from you all on your own “approach and take” on creating such an animation using out of box Xcelsius components. On Monday October 18th, Reportapalooza introduced the entries to it’s fourth installment of the “virtual” reality show style campaign in a challenge dubbed “Dash for Charity”. In this challenge, the experts were paired with a charity to design and develop a visual model using SAP BusinessObjects Dashboards (Xcelsius). The goal of each dashboard was to help promote and spread awareness for each expert’s chosen charity. For me, this has been the highlight of Reportapalooza. And I’ve been looking forward to this challenge since the beginning of the campaign. I love the idea of donating my time and energies on a project that could potentially make a difference in someone’s life. Hopefully all of our dashboards will be used to help the people that actually “help people” – long after the campaign is over. Posted in: Announcement, Dashboards, Events, Promotion.